Three militant groups – Niger Delta Volunteers, Niger Delta Peoples Liberation Movement, and Bakassi Freedom Fighters – have criticised Vice President Yemi Osinbajo saying that militants were fighting for their pockets. 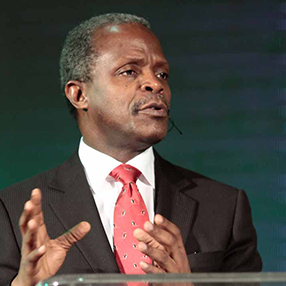 Osinbajo had reportedly accused the militants of being partly responsible for the economic woes of the country, while delivering a lecture at Elizade University in Ondo State. The militant groups, however, said instead of ridiculing them, the vice president should have advised President Muhammadu Buhari to address the injustice in the Niger Delta. They made their grievances known in a statement signed by their spokespersons – Ekpo Ekpo for NDV; Henry Etete for NDPLF and Asukwo Henshaw for BFF. In the statement, which was made available to journalists in Uyo on Tuesday, the militant groups also criticised Buhari for saying that Nigeria’s unity was not negotiable. They added that the people of the Niger Delta were tired of one Nigeria filled with injustice, marginalisation and oppression minority ethnic groups. As a result, they vowed to resume attacks against oil companies operating in the region and they urged oil unions to withdraw their members from rigs and platforms for their safety during the period. The groups also condemned the newly constituted Board of the Nigeria National Petroleum Company and demanded the appointment of someone from the Niger Delta as GMD. “It is an insult on the Niger Delta region that the Minister of Petroleum who also doubles as the President of Nigeria is from the North, the Group Managing Director, Dr. Maikanti Baru and four other members of the board are also from the North,” they said. Furthermore, the group asked the Economic and Financial Crimes Commission to investigate what happens to local government funds in Akwa Ibom State. This, they said, was because in the past one year there local government area in the state had carried out people-oriented projects.